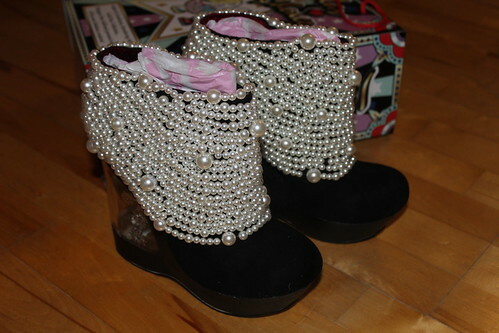 t*rexes and tiaras: Sunday Shoes 062: Irregular Choice Balletomane.. This story isn't going to have a happy ending; I'll warn you now. 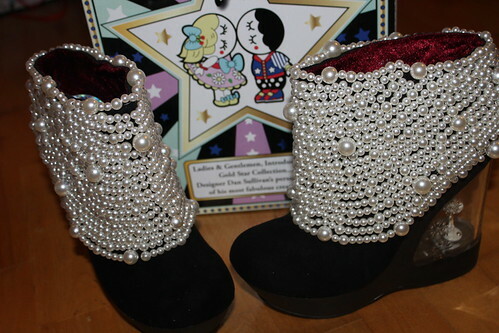 Once upon a time I saw a photo of these Balletomane shoe boots, covered in pearls and with a dancing ballerina in the heel. I absolutely fell in love with them and couldn't wait until they were released. They got released at midday on October 17th and by 12.02pm I had an email confirming that my pair had been ordered and paid for. Later that day I received another email to say there would be a "slight shipping delay". I wasn't told when they'd be sent out, so assumed this only meant a couple of days. Apparently not. I emailed five days later to ask if there was any news and was told that the original pair I'd ordered were faulty, so they were waiting for another pair to be produced in China. They would then be sent to the UK and then sent out to me. I was a little disappointed, but at least I knew that I'd receive a perfect pair, which would be checked before they came out to me, right? Sadly not. When the shoes arrived, on Wednesday, 12 days after I'd ordered them, I was so excited to get them out of the box. 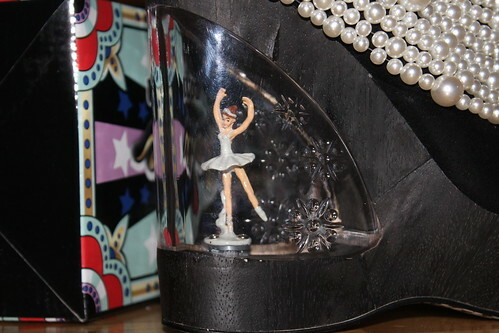 The ballerinas in each heel are fabulous and have a key underneath, built into the heel so that you can wind them up. They spin and dance around to "Twinkle Twinkle, Little Star", just like a music box. Immediately my heart sank, though, as I could see that each of the shoes were damaged to the wooden covering around the heel. It's a kind of paper-thin wooden covering, rather than anything sturdy, and it's chipped on each shoe in several places, like in the photo above. Part of me was torn. I'd been waiting for these to be released for months and they'd sold out on release day. Did I return them or keep them and see if I could try and fix them. 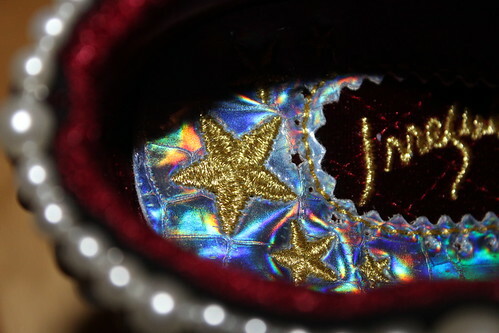 I was advised to glue them by the team at Irregular Choice. I considered it, but realistically, the cracked pieces are just going to come off and look a lot worse as soon as I start trying to glue them. And for an expensive pair of shoes, I just don't think I should have to do that. I figured I'd email the customer services team and ask if there was another pair in my size anywhere which I could exchange this pair for. I think that the term "customer service" is used in the loosest possible sense of the word, as the first reply I received was a request for photos as they didn't believe there was anything wrong with them. I sent them some pictures of the damage and got a really disinterested "sorry that the finish is not quite perfect" email, saying that I could send them back if I want to. The team made it absolutely clear that they don't care either way, nor about the disappointment caused by their appalling service. Again. I was shocked to be told that I should have emailed to ask them to check the shoes before they were sent out. Surely that is a fundamental part of the packing process when you run an e-commerce business? 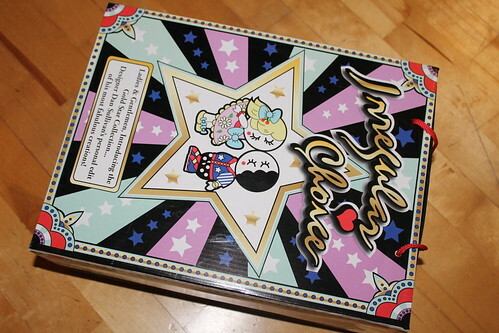 The whole experience has not been my first issue with Irregular Choice, but it's going to be my last, as I won't be buying from them again anytime. I have supported the brand for more than ten years now and have a lot of their shoes, but recently it's been sad to see how much worse their customer service has been. It shouldn't matter whether you are buying your first pair of Irregular Choice shoes, or your four-hundred-and-first, a customer should be able to expect their item to arrive within the timescale given to them, and to arrive intact and not damaged. 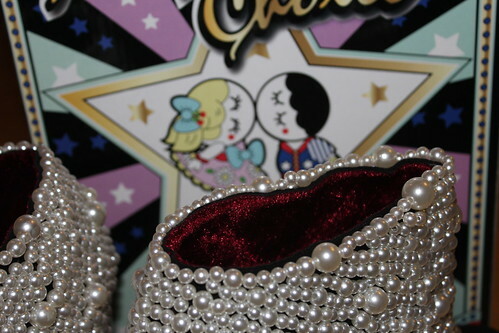 Sorry, Irregular Choice. It's not me, it's you. I know. I'm so gutted because I have loved this brand for so long, but after being treated like dirt in their shop and then having numerous issues with broken and damaged items being sent to me, I've just had enough. I know, I'm really gutted. Holy moley. I cannot believe they advised you to glue your shoes to fix them!! That is absolutely outrageous. No matter what price you pay for your shoes they should arrive in perfect condition, what on god's earth are they playing at?! I know, sadly it's not even the first time it's happened either. I recently had a pair arrive where the sole had come unglued from the shoe. They again, advised me to take them to the shoe-repair shop and have them reglued. I'm really unhappy to hear about your experience. I'm genuinely shocked to hear of the lack of customer service when I've only known good responses personally and from others in dealing with them. It's the first time I've seen (real) photos of the pearly ones and they are even more lovely than the stock photos. For the price though, I would not accept a damaged item (actually even if they were £50 shoes, my answer would be the same), definitely return them. I also would be going nowhere near them with glue! I always send photos of damaged items (rarely shoes, usually dvd's or makeup or something) with my email, so they can see how badly it was packaged or the damage clearly (it can often help in trying to explain which parts you mean and I always think each person has a different view of how 'bad' a scratch, rip or breakage is), but I can't believe anyone would sell something online and it NOT be checked before despatch. Especially because of the circumstances leading up to the 2nd pair and especially for that price. I study everything I sell on ebay before I list it and again when I go to package it, to check nothing has happened since. I would do it for a £2 top or £200 pair of shoes. I'm really sorry that they've lost your support after all these years. You've really championed the brand (I had a similar experience with another brand (though they wouldn't take the shoes back) and in the end I sold almost every pair I owned from them and stopped following them on FB etc as I just couldn't look at the 'good' pairs without remembering the fiasco with the other pair and the money I'd lost and I didn't want to be associated with the brand at all). I'd be really sad if you had to do that. I know, I'm so sad mostly because I know I'll not get another pair of the pearly ones and have waited months for them to be released and then a lot longer than most people seemed to to get my pair. They're so unusual which was why I was really torn about whether or not to send them back, but the rudeness I received from their customer service team has really made that decision for me and is the main reason I won't be buying from them again. I know, I was amazed. I'm not sure why they weren't checked before they were sent but it was very disappointing. Gosh thats shocking service! Fancy loosing such a valued customer over such an easy thing to fix. How awful! Shocking service. I would expect so much more for shoes that expensive. IC are letting themselves down by having such low standards. So sorry to hear about your shoes, they would have been so pretty otherwise. What a disappointment. I've seen bits and pieces about your woes with the brand on twitter but I;m still shocked by this frankly weird attitude to customer service they seem to have...! I know, I was seriously confused by the whole thing. omg that is disgusting. I've always wanted a pair of these shoes but that has got me thinking!